Sunshine Coast Motor bike Radiators at Hi Tech water cooled Motorcycles, Road bikes, Race bikes, Motocross Motard Repairs. 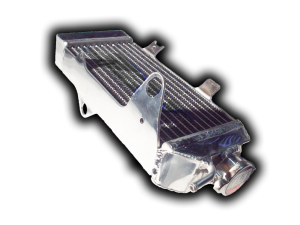 Hi Tech Motorcycle Radiator specialists for road bikes, race bikes, motocross, motard, farm bikes. Australias hot climate increases the average engine temperature causing accelerated wear and tear on your dirt bike engine. We can supply the perfect addition to your performance bred race bike or hard working trail bike. 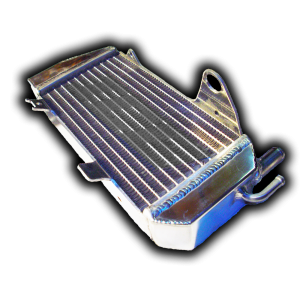 These hand built TIG welded alloy radiators are designed for high demand engines. 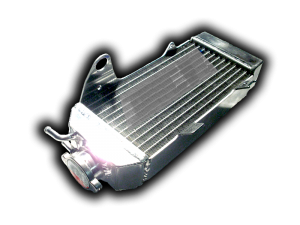 Enhanced Cooling alloy radiators run cooler engine temperatures due to their highly efficient 40 mm core or high density core. 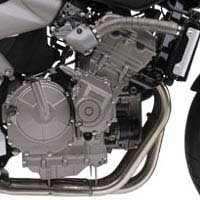 In addition, the larger core allows for increased coolant flow which puts less strain on the water pump. The results: less friction on the water pumps components, a longer life and added horsepower. They are a direct-fit replacement item. High Quality. Radiators are finished with a billet alloy filler neck and a high polish. Every cap side radiator includes a suitable radiator cap. Radiators hand made quality finish. 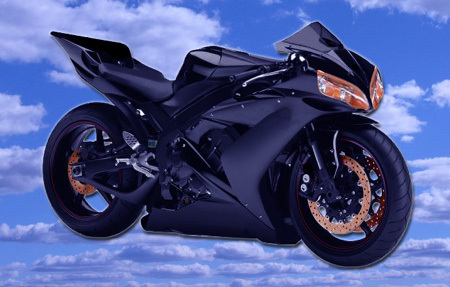 Hi Tech Coolum Radiators can recore, repair or replace your motorcycle radiator.